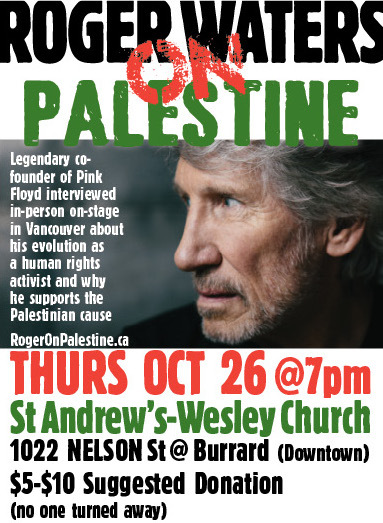 On Thursday, October 26 2017, Roger Waters, the creative power and songwriting force behind Pink Floyd, will discuss his evolution as a human rights activist and his support for Palestinian rights during his Vancouver concert visit. Waters’ long-time political activism became focused on Israel/Palestine in 2006. He is one of the most prominent celebrities to join the BDS (Boycott, Divestment, Sanctions) movement, speaking out against Israel as an apartheid state as well as its mistreatment of Palestinians living under Israeli military control in the Occupied Territories. In 1965, Waters co-founded the progressive rock band Pink Floyd, often called “the best band of all time.” He performed his iconic album The Wall in 1990 to commemorate the fall of the Berlin Wall. Waters will appear at St. Andrew's Wesley Church,1022 Nelson St., Vancouver, on October 26 at 7pm, where he will be interviewed by Martha Roth, a member of Independent Jewish Voices Canada. The event will be chaired by Itrath Syed, an Instructor at Langara College and Simon Fraser University.